Google Hangouts is a singular communications platform developed by Google to help users initiate and engage in various communications channels, including text, voice or video chats. The platform has proven to be effective in either one-on-one implementation or in a group. Hangouts are integrated into Google+ and Gmail. For added mobility and versatility, mobile apps for iOS and Android devices are also available. Despite of being perceived as a messaging platform for individual users, Google Hangouts handles with ease the communication demands of corporate environments. The advantage in such case is that the employees get to communicate using a platform reminiscent of social networks, and feel comfortable sharing information they know will be secured in accordance with newest protection standards. Being a Google product, Hangouts has no trouble integrating with popular business systems and applications, among others Slack, West Unified Communications, Zendesk, Fresh Service, Sprint, and many more. The pricing scheme is also flexible to allow all types of companies to get grasp of its functionality. Google Hangouts’ pricing starts at $5 for 30 GB of storage, and only the double to make the storage unlimited. 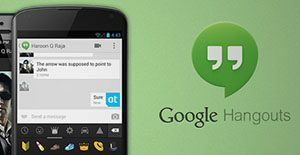 With all reputation of Google to back it up, Google Hangouts is without any doubt one of the most affordable and handy communication tools available in the market. It is because of this that it currently holds one of the leading positions in our Communications Software category, following providers such as Skype, 8×8 VoIP, RingCentral, and ShoreTel. For businesses that engage in or require video broadcasting, Hangouts also has a feature called Google Hangouts on Air, which enables Google+ users to stream video calls live via YouTube. Hangouts on Air has proven to be an efficient and inexpensive way for business to conduct online seminars and talk shows. Users also get to integrate it with popular business systems and service providers, among which Zendesk, Slack, Fresh Service, and many more. Google Hangouts effectively combines the features and functioalities of previous Google business apps, specifically the Google Talk app. With its integration with Google Voice, Hangouts offer users with the capability to call domestic phone numbers from their computing devices for free. Each company is different, and can call for a particular type of Communications Software solution that will be designed for their company size, type of customers and employees and even individual industry they deal with. You should not count on finding a perfect solution that will work for each company no matter what their history is. It may be a good idea to read a few Google Hangouts reviews first and even then you should pay attention to what the service is supposed to do for your company and your workers. Do you need a simple and intuitive solution with just essential features? Will you actually use the complex functionalities needed by pros and big enterprises? Are there any specific features that are especially useful for the industry you work in? If you ask yourself these questions it will be much easier to find a reliable app that will match your budget. How Much Does Google Hangouts Cost? Google Hangouts is available for free for receiving and making calls and video conferencing. We realize that when you make a decision to buy Communications Software it’s important not only to see how experts evaluate it in their reviews, but also to find out if the real people and companies that buy it are actually satisfied with the product. That’s why we’ve created our behavior-based Customer Satisfaction Algorithm™ that gathers customer reviews, comments and Google Hangouts reviews across a wide range of social media sites. The data is then presented in an easy to digest form showing how many people had positive and negative experience with Google Hangouts. With that information at hand you should be equipped to make an informed buying decision that you won’t regret. Keeping things connected through Hangouts. Chatting and video conferencing has never been this simple and free! What are Google Hangouts pricing details? What integrations are available for Google Hangouts? Pros: You can easily call any phone number in any country at a reasonable price. You can call phone numbers and even Gmail contacts, with the option for video conference calls with several contacts at the same time. Cons: You can not have your own phone number. If you want people to call you, you will have to provide maybe a Skype numbe, which is bad because you sometimes will have to switch between apps just to receive calls. Pros: The integrations with various Google products (Gmail, Google Calendar, etc) make my life easy. The iOS app is also nice and works well. Screen sharing is nice and conference calling is a must have and works well. It's easy to setup as well. Cons: Like most Google products after a year they seem to go downhill. i've had issues with dropped audio in the last few weeks. It's a decent resource hog for me and if you have more than a handful of people on a call it can get real spotty. The website's interface is not intuitive to me as well. I use this on a daily basis. Using Hangouts day in and day out.